Certain myosin isoforms (i.e. 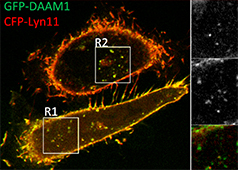 myosin II) form bipolar assemblies via the extended coiled-coil domains in the heavy chains (see also “thick filaments”). 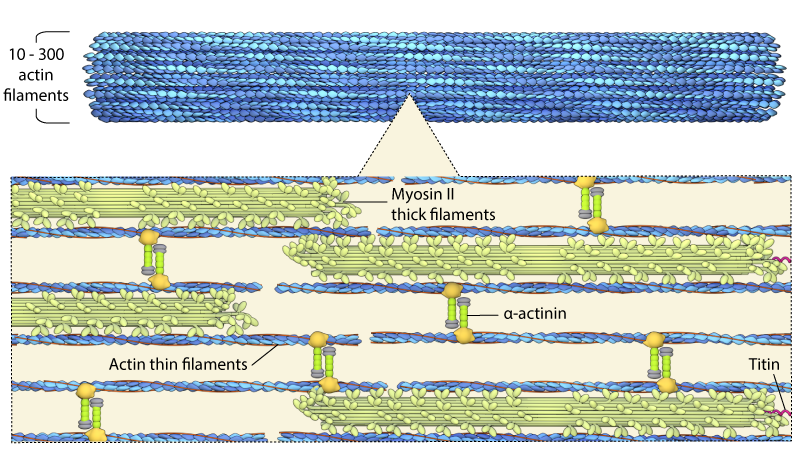 Actin “thin filaments” with opposite polarity associate with thick filaments to create contractile bundles that can be found in both muscle and nonmuscle cells. The concerted movement of the myosin heads generates the forces needed for contraction and causes the adjacent actin filaments to ‘slide’ past each other. 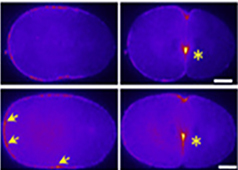 Evidence for the sliding mechanism of force generation, comes largely from in vitro reconstitution studies, particularly the sliding filament assay created by Kron and Spudich . 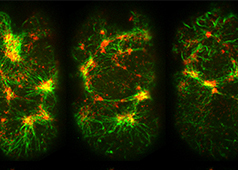 This assay and subsequent variations of it demonstrated the ability of myosin to bind and slide individual actin filaments  and have further elucidated the biophysical properties of this action . 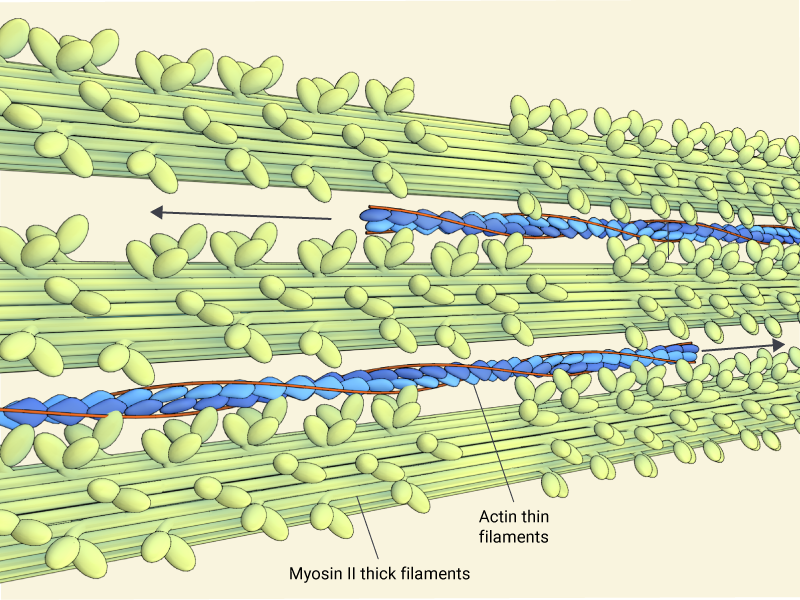 Schematic depicting the basic structure of a contractile fiber, which consists of myosin containing contractile “thick” filaments, and actin “thin” filaments. Contractile bundles vary in thickness and have been shown to contain anywhere between 10 to 300 individual actin filaments . 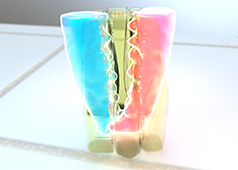 These bundles are stabilized throughout the bundle and at the filament ends by a number of accessory proteins (e.g. α-actinin, titin, components of the focal adhesion complex). 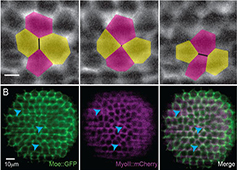 Contractile bundles are also crucial for generating both traction and protrusion forces in motile cells and they are involved during cell division (e.g. 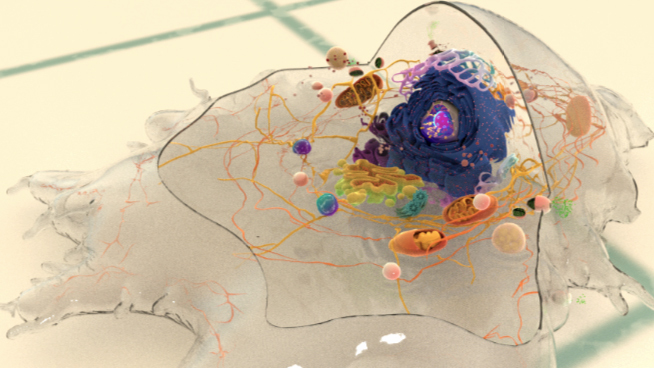 cytokinesis). 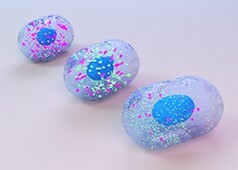 For studies which investigate the role of cell contraction and motility, contractile force can be inhibited using small molecules such as blebbistatin . This is a cell-permeable, highly specific small-molecule inhibitor of myosin II Mg-ATPase activity  that is used for investigating the role of myosin II in cell contraction and motility. 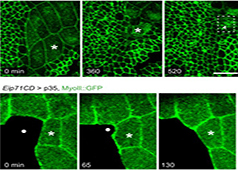 Blebbistatin inhibits both myosin isoforms IIA, IIB, and skeletal muscle myosin II but has little effect on smooth muscle myosin II and myosins I, Myosin V, and Myosin X .